Sleek and simply functional, the Futura Stool is ideal for artists and draftsmen alike. 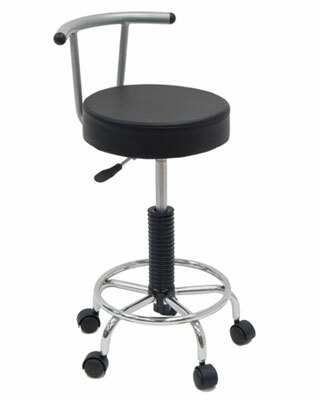 The pneumatic gas lift smoothly raises the seat from 19.5" to a height of 25.75". The sturdy five-star base supports a scratch-resistant chrome footring and includes 5 casters for mobility while the powder-coated steel backing assures strength and durability. Pneumatic Gas Lift raises Seat Height from 20.25" to 25.75"